Student loan debt may the next bubble waiting to burst – with potential repercussions for many other areas of the economy, particularly housing. Although new and recent grads are playing a large part in the rising rental demand, the student loan debt they’re carrying makes it impractical, if not impossible, to take on a mortgage. Although the student loan problem has been worsening for the last decade or so, it’s gone largely unnoticed in the face of other economic crises. But as student loan default rates spiraled after 2000, surveys on the cost of college education revealed some stunning statistics: the average 2011 college graduate finished school with over $26,000 in student loans – and two thirds of these recent graduates had some kind of student loan debt. For many students, the old standby of working your way through school simply isn’t possible. To meet the basic tuition demands of a typical state university, a student might need to work full time at a professional level job. And for those whose families can’t foot a major part of the bill, financial aid comes to the rescue in the form of a variety of loans and stipends that may not require repayment until after graduation. A shrinking job market in many sectors, along with increased competition for the jobs that are available makes it difficult for students to get themselves out of debt. That’s one reason why many recent graduates end up still living at home while they try to launch a career. But those who do find work and strike out on their own typically choose to rent, rather than take the step of buying a home. One reason why these new and recent graduates are avoiding home ownership, say financial experts watching the student loan crisis, is simply a fear of assuming the debt burden of a mortgage. That fear spills over into other kinds of borrowing, too – this generation is also showing reluctance to assume other loans and major credit card debt. 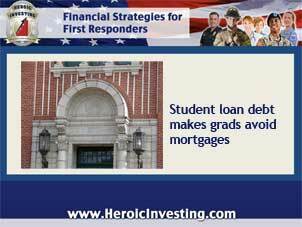 What’s more, defaulting on a student loan ads a blemish to a young credit score that may take years to erase – and makes it difficult if not impossible to qualify for a mortgage at all. A recent poll of “millennials” revealed that many respondents did hope to buy a home someday but uncertainty about their finances made that unlikely in the near future. Mortgage Rates: Ready to Take a Jump?